High Launch and Low Spin. Designed for controllable distance from any lie on the course, the offset hosel design helps the G20 hybrids create the high launch and low spin that improve your accuracy. A large, internal weight inside the 17-4 stainless steel head provides forgiveness and distance. 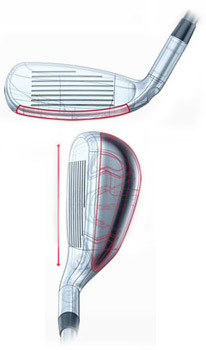 The G20’s flatter lie angle improves eye appeal while ensuring control and confidence. More bounce and sole camber offer exceptional ground impact and smooth transitions from all conditions. A blended crown design improves optics for easy alignment. Exceptional ground impact and versatility result from more bounce and increased sole camber both front to back and heel to toe. A shorter heel to toe length ensures playability from all conditions and provides a flatter lie angle and softer crown shape for an improved appearance at address. I broke the original 4 iron and this became my very dependable replacement. My first Ping Hybrid. A very nice club..